Welcome to Sam Mehta's Website! Enjoy the visit! 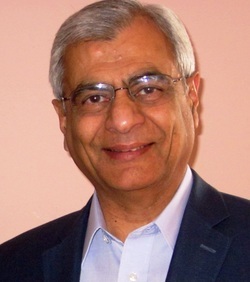 Sam Mehta was the President of Integrated Technologies, LLC., a Management Consulting and Training Organization. The firm specialized in "change management" where operations, processes, and people resources were studied and changed to improve the client's operating effectiveness. Sam has assisted over 150 corporations in making them efficient, productive, and profitable. Sam was a director at Coopers & Lybrand (now PricewaterhouseCoopers, LLP) at their upstate New York Management Consulting Service (MCS) practice. Sam was the Managing Director of one of Carrier International Corporation's (United Technologies Corporation) overseas manufacturing operations and CFO of Pars Toshiba Industrial Corporation. Sam is a Distinguished Toastmaster (DTM) and a member of Empire Statesmen Toastmaster Club (establish 1954) in District 65 of Toastmasters International (TI). Sam became Distinguished District Governor during the year 2006-2007 and was inducted in the Hall of Fame at the TI convention in Phoenix, AZ. In April 2009, Sam was the recipient of the District's highest award given to a Toastmaster - the Pat Panfile-Ben Luce Memorial Award. Sam joined Empire Statesmen Toastmaster Club #1427 in Syracuse, NY in March 1997. During Sam's term as President of the Club (2000-2001 & 2012-2013 & 2017-2018) the Club became Presidents Distinguished; the highest performance achievement for a Toastmasters Club. Sam has received 'triple crown' awards for 5 consecutive years [2013 to 2017] for completion of three or more educational awards in each year. Sam is the 'Chief Ambassador' for District 65, responsible for the promotion of the 'Pathways' - the new educational program for Toastmasters International. Sam is also a Pathways Guide and Coordinator. Sam is the 2015 recipient of TI's highest honor - the 'Presidential Citation' in recognition of his outstanding achievements in representing the goals and ideals of Toastmasters International. In September 2018, Sam received the District Toastmaster of-the-year award in recognition of his exceptional leadership and devoted service. Sam was a member of a high-powered delegation at the World Court in -The Hague, in the mid-1980's. He has traveled extensively in Europe, Asia, and the Pacific-Rim. He speaks several Indo-European languages. Sam is a 'Gold Life Master' and a Bridge Director certified by American Contract Bridge League (ACBL). In the year 2008 as well as in 2009, Sam was the 1st place winner in the number of ACBL master-points won at the 'Ace of Club' tournaments in the greater Syracuse area clubs. Sam was also the 1st Place winner (based on the highest percentage of points won during the year) at the 'St. Ann Bridge Therapy Group' for the year 2009 & 2012. In the year 2013, Sam won more 'first-place' winner-position at the Syracuse Contract Bridge Club & Liverpool Bridge Club in the greater Syracuse, NY area; than any other bridge player. Sam has won a total of 22 medals during a 4-year period (2002 to 2006) at the Empire State Sr. Games (New York State Olympics Games for over 50) in the Swimming, Table Tennis, and Duplicate Bridge events. Sam was the member of the 1986 YMCA swimming team that broke the world record in 'most participants in a one-day swimming relay-event' appearing in the Guinness Book of World Records. Sam was a leader of an NGO team and presented at the United Nations (UN) headquarters in New York, NY on March 5, 2003, on the subject "Microcredit - A Step Towards Uplifting Women" at the 48th session of the UN, on the Commission on the Status of Women (CSW). Sam is a Certified Management Consultant (CMC) from Institute of Management Consultants, Washington D.C., and has a degree in Business. In addition, he is an alumnus of Harvard Business School's 'General Management Development Program' (GMDP). To open PDF document files you may need Adobe Reader, a free download. To open WMV video files you may need Windows Media Player, a free download.